Good Looking on the Inside AND Outside! Do you remember that person in high school that oozed with punk rock, zine reading, sci-fi coolness? Some people may have thought they were “strange”, but not you. Oh no. You anticipated passing them each day in the school hall hoping maybe, just maybe you would get a nod or half smile. You’d make it a point to shop at the vintage record store they worked at and attended every one of their band practices and concerts…swooning over their latest tattoo or work of art! Think of THAT person. THAT record store. THAT band. 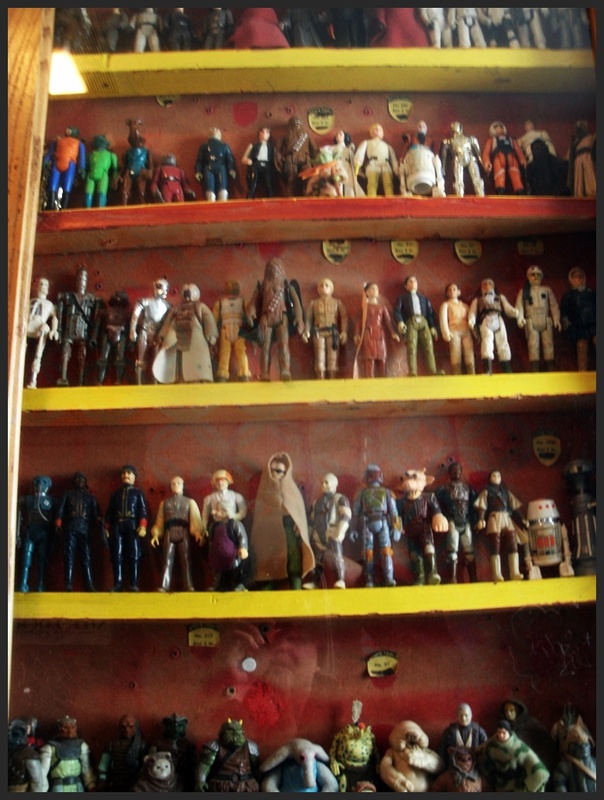 Now add in a mix of nostalgic funhouse, quirky neon-lit bar, eclectic local art gallery, 70’s facial hair, one-of-a-kind thrift store finds and delicious, innovative cuisine and you have Julian’s. 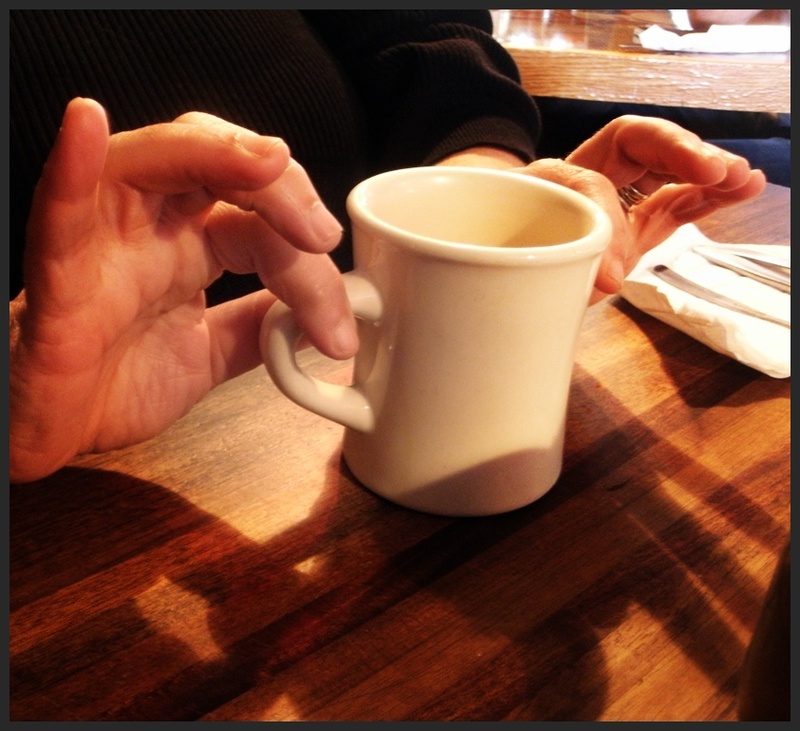 I recently had the pleasure of dining at Julian’s for Sunday brunch with – my mom. Yes. My mother. One of the best dining companions a lady can have! 😉 My, may I add, extremely “hip” mother (who is pushing 60) developed crushes on our host, Sam, and waiter, Anthony. I could understand, as they were both irresistibly appealing. May I also add that I noticed many other young folk dining with their “mom’s” as well. Just saying. And she did REALLY well on the “mom, please don’t embarrass me” front, only causing me to flinch once, when she kept introducing herself as “THE MOM”, not Linda, but somehow, at Julian’s — it’s all good. My love affair started before I even entered the restaurant. 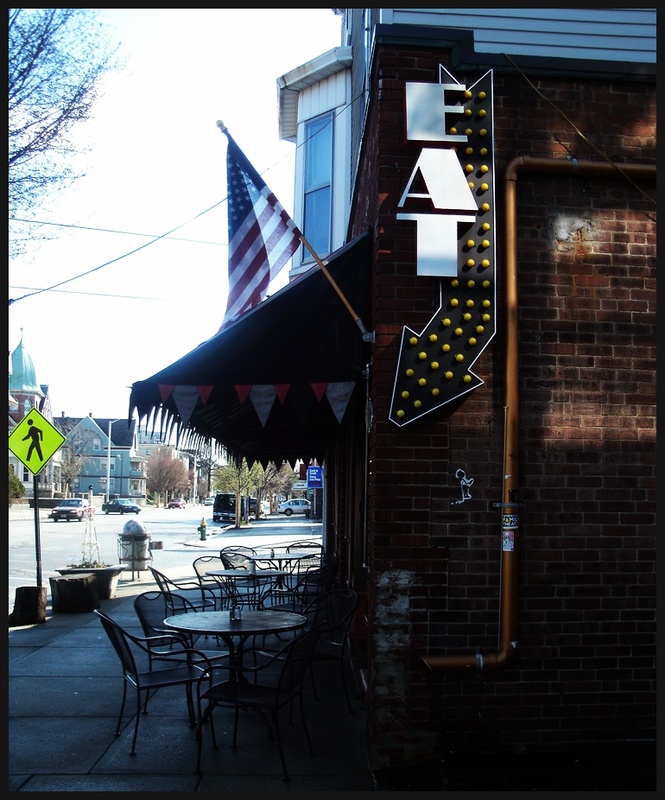 I absolutely love the large, light-up, EAT sign that hangs on the side of the restaurant and the record shop/rock club/tattoo parlor-vibe of the exterior. I could understand why they have the light-up EAT and neon RESTAURANT signs, because one could easily mistake Julian’s for anything BUT a restaurant. DID YOU KNOW? 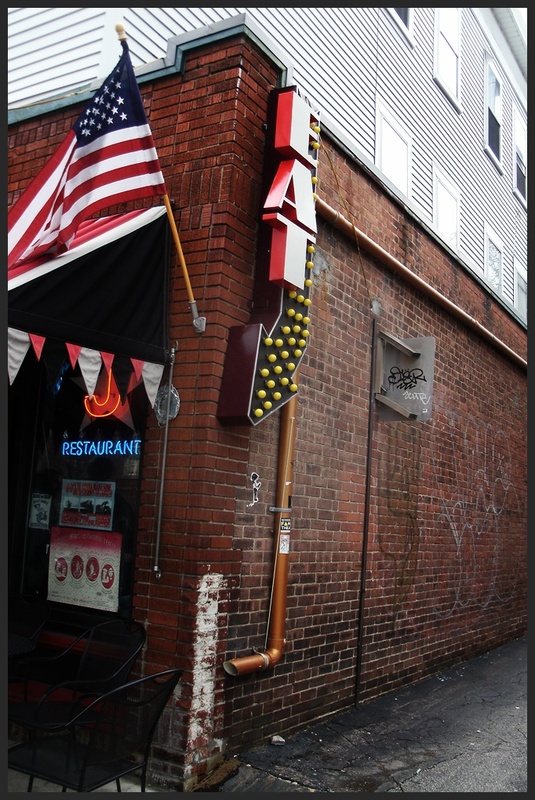 Julian’s opened in 1994 and expanded in size a few year’s later (by literally knocking down the wall one night). 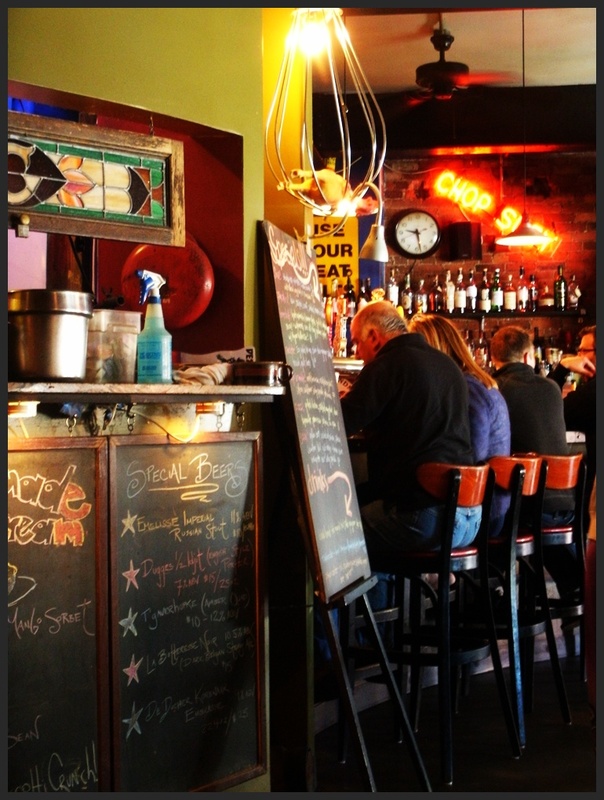 In 2000 Julian’s received their liquor license (they had BYOB until then). They started with 6 bottle beers, a red & white wine and 6 spirits. 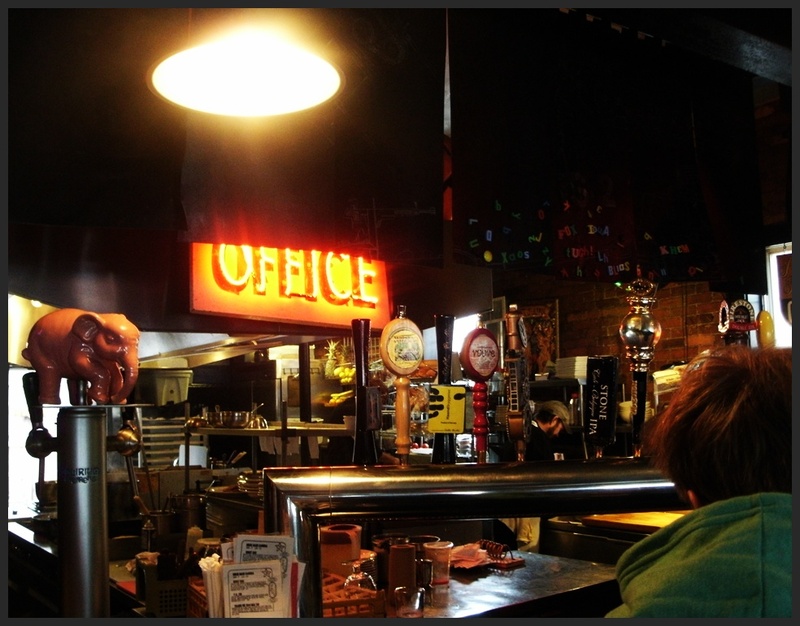 Around 2001 they began expanding their liquor program and started showcasing more craft beers and wine. In 2003 they had to close for 9 months to complete renovations (after the station nightclub fire all buildings in the area had to renovate to be up to modern code). This proved to be a painful period for Julian’s, however, they reopened to a great deal of love and support for the public (whew)! In the new format they grew to being open daily for brunch and dinner. They even curate a special board of 6-10 items each shift focusing on fresh, locally or house made products in addition to their large menu, which features tons of house made items, including: smoked salmon, granola, ketchup, cured meats, tempeh sausage, seitan, pickles and sausages – just to name a few. They now have 19 beers on tap, featuring at least 5 Belgian Ales as well as many other hard-to-find offerings as well as one cask beer engine, 60 bottles of beer, small batch of wines and an impressive cocktail list which features new takes on vintage cocktails as well as house infused liquors. Also, Julian’s has a series of beer dinners which occur every 6-8 weeks, consisting of a 6 course meal paired with 8 beers. When I first walked in Julian’s I was greeted by the host, Sam. I was instantly transported back to that teenage, star-struck, high school girl, and within seconds knew Sam would’ve been a crush of mine (it doesn’t matter that I am lesbian…..there’s just “Something About Sam.”) It could’ve been his impressive facial hair, twinkle-in-his-eyes-softness, or retro, Country-Western shirt, I just knew – I liked him. 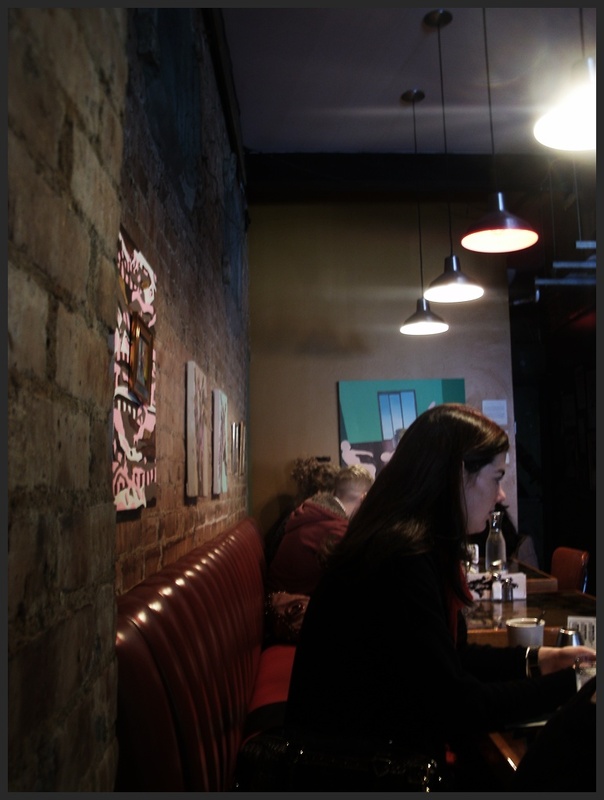 I felt my adrenaline rush as I soaked in Julian’s decor as Sam showed us to our table. Quirky, kitschy, retro, artsy — yes, all of these words summarize the vibe, but you have to experience Julian’s for yourself to get the TRUE feel. 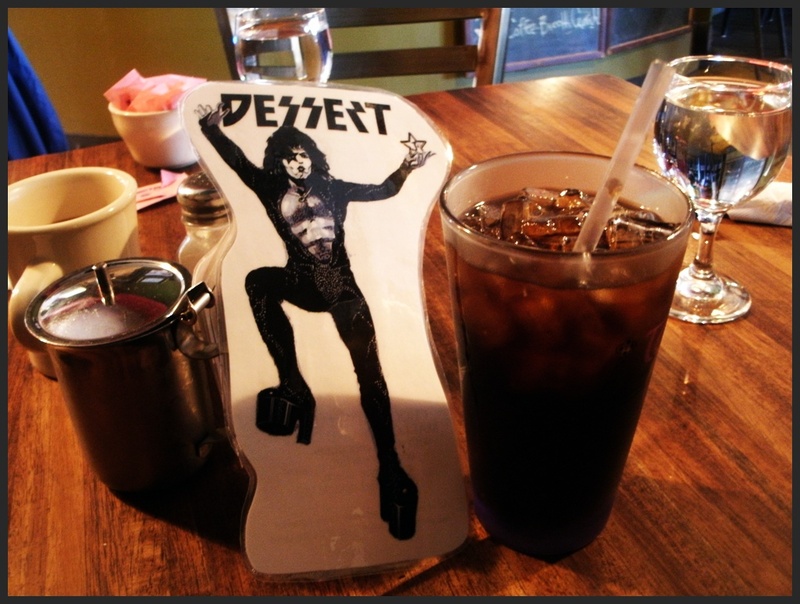 Where else will you find a dessert menu with Kiss’s Gene Simmons on the front or a large spatula light with a rubber chicken inside? 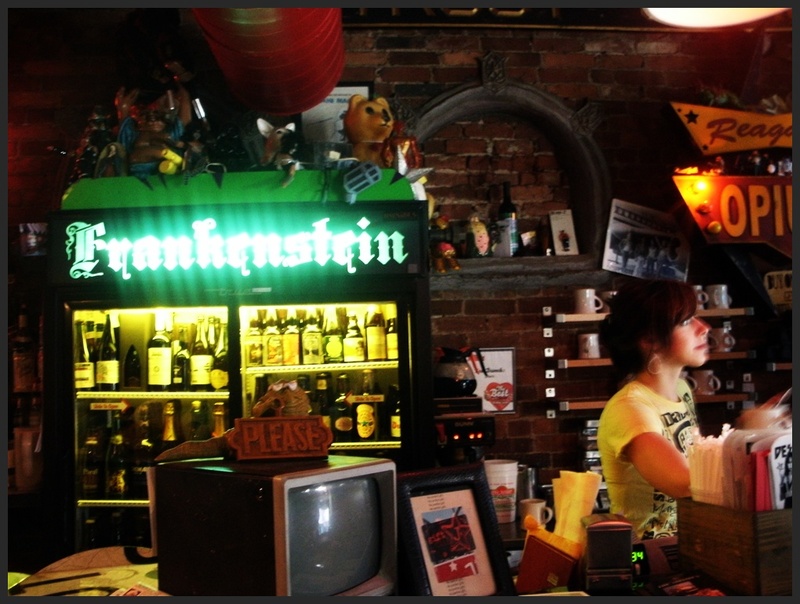 A haunted mansion type chandelier, Or a neon green Frankenstein Beer sign?? 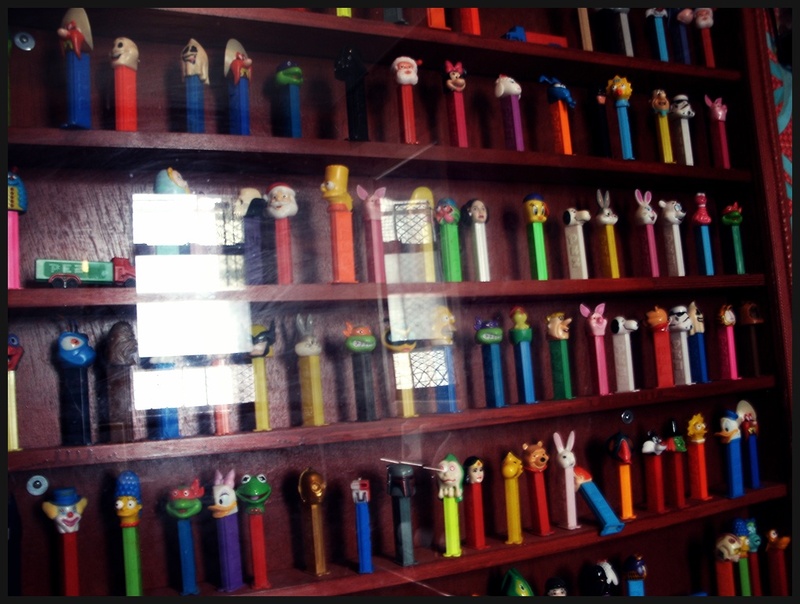 How about a bathroom with the most impressive Pez collection I’ve ever seen and a display box of Star Wars characters (which I too had as a little girl)? 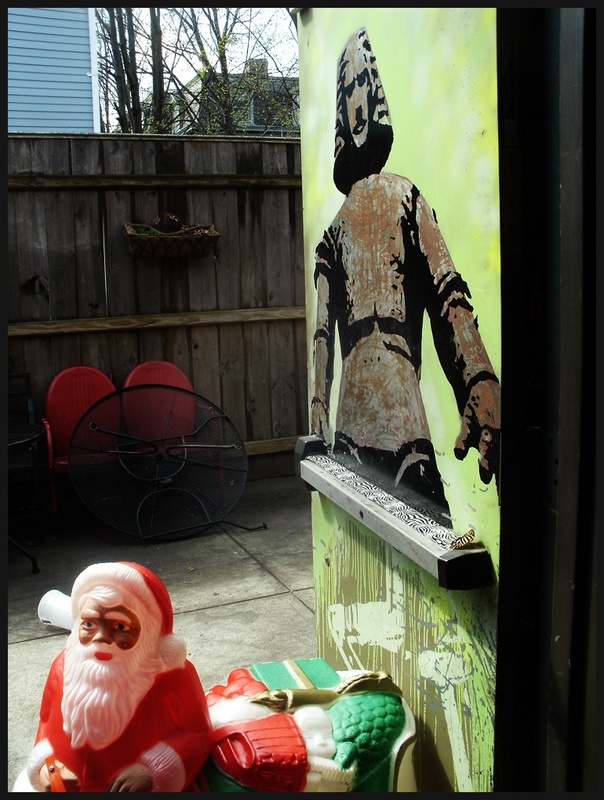 There was even a plastic Santa Claus leading to their back patio (which has additional seating during the warmer months). Julian’s is a feast for the eyes. But is Julian’s a feast for the taste buds? YES! YES! and YES! Meat eaters, vegans and vegetarians unite! There is something for every palate! 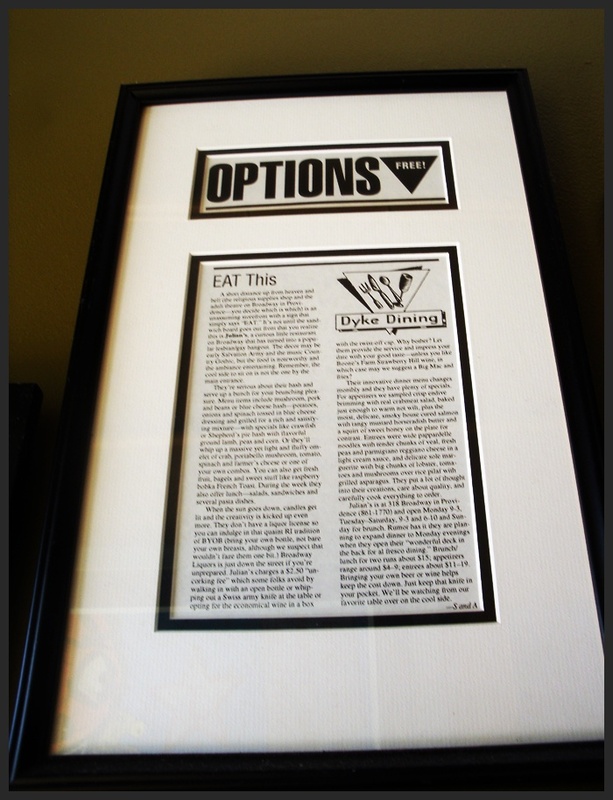 Their menu is truly imaginative and innovative and they pride themselves on using healthy, organic products. Their menu changes seasonally to showcase the best in what is being harvested at the time as well as keeping things as fresh as possible. It was so hard deciding what to order! My carb craving self settled on their 3 piece French toast with real maple syrup and a side order of sweet potato hash with broccoli & swiss. My mother ordered their two eggs special with homefries and a bagel. She also tried a single chocolate chip pancake. While waiting for our meal, we noticed how busy it was getting. We arrived shortly after they opened (9am) and it was already bustling inside! By the time we left there was a wait OUTSIDE! We also noticed how nice looking everyone was! No. Really. 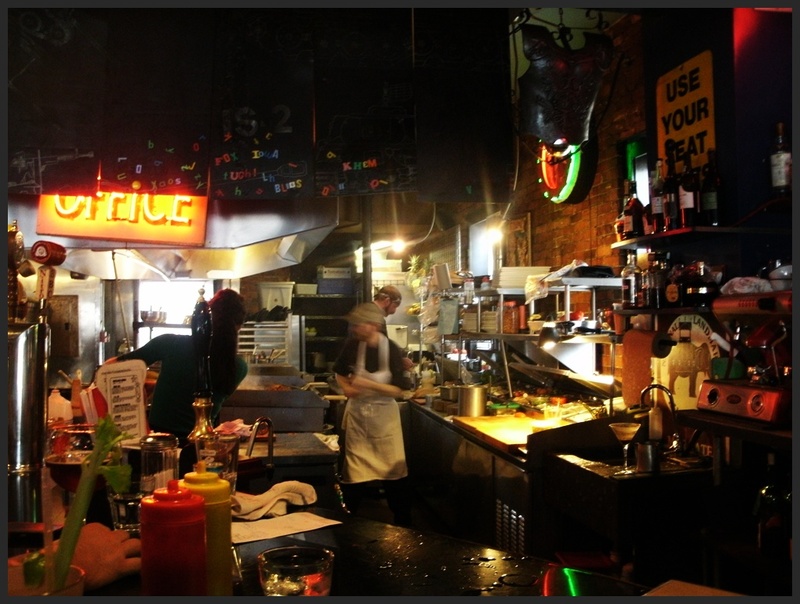 The people at Julian’s, both the workers and diners, were some of the best looking we have ever seen – anywhere. There was a mix of ages and styles, but the overall vibe was hipster, starving artist, college student and musician. Breakfast was served quicker than I thought it would be, based on how busy they were! 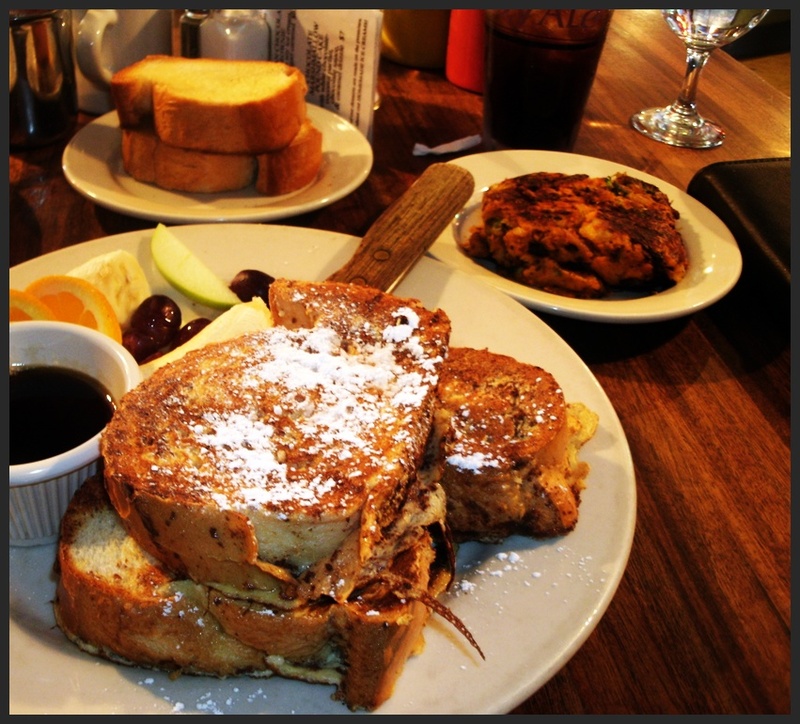 I was beyond impressed with the thickness of the French toast! It was huge! Also, the side of fruit that was served with it was super fresh. I rarely eat the little sides that automatically come with a dish, but this fruit was just too good to pass up! Best of all? The French toast tasted as good as it looked. I usually manage to take 1/2 my food home as leftovers, but I ate every last bite. I couldn’t get enough. The sweet potato hash was delicious as well. The flavor wasn’t over-powering so you could taste each ingredient with every bite. I love how it was crisped on top and oozed with swiss cheese. My mother loved her breakfast as well and raved about their homefries, which she said were lightly seasoned and cooked to perfection. 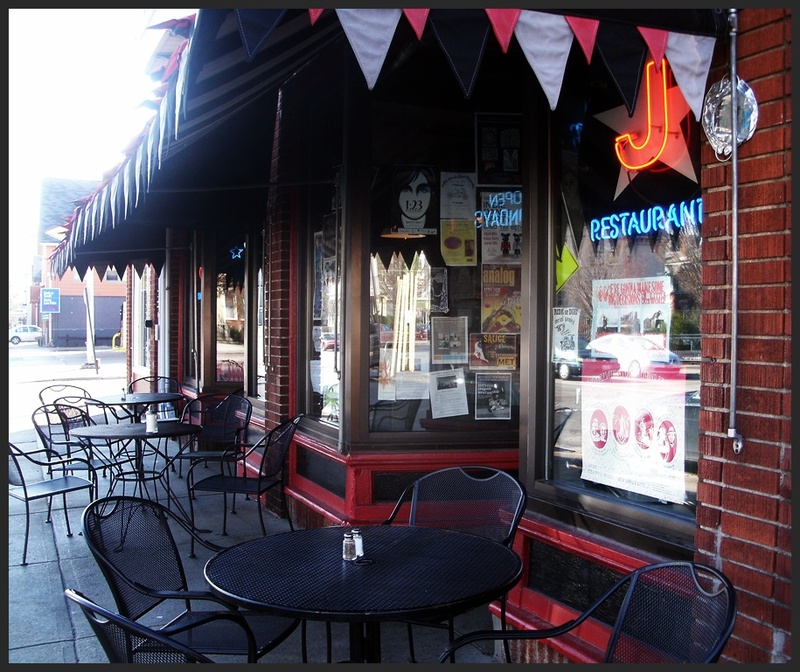 Julian’s is open for brunch & dinner 7 days a week. 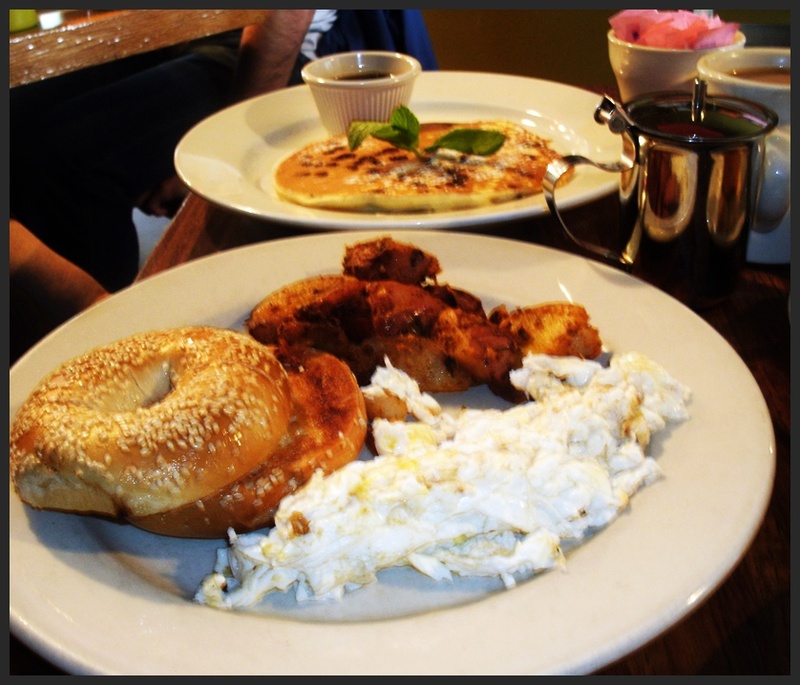 Brunch is Monday-Frieday 9am-5pm and Saturday-Sunday 9am-2:30pm. Dinner is served daily from 5pm-11pm. Drinks until 1am every night. 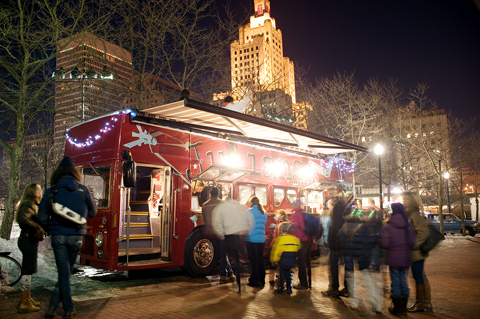 In 2010 Julian’s realized a longtime dream to create a double decker food bus! The seats in the first floor were completely removed to make room for a fully operational kitchen. 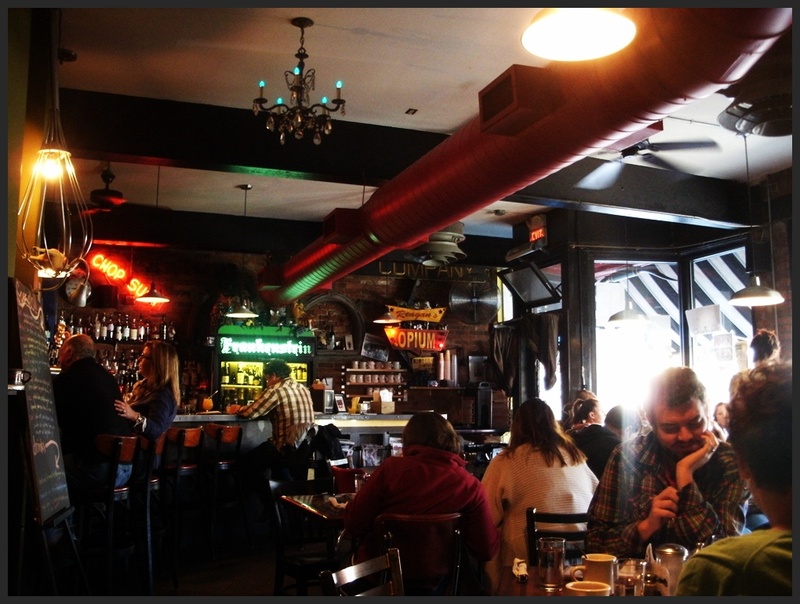 The seats on the top floor were retro-fitted to face each other around custom tables made from old maps! 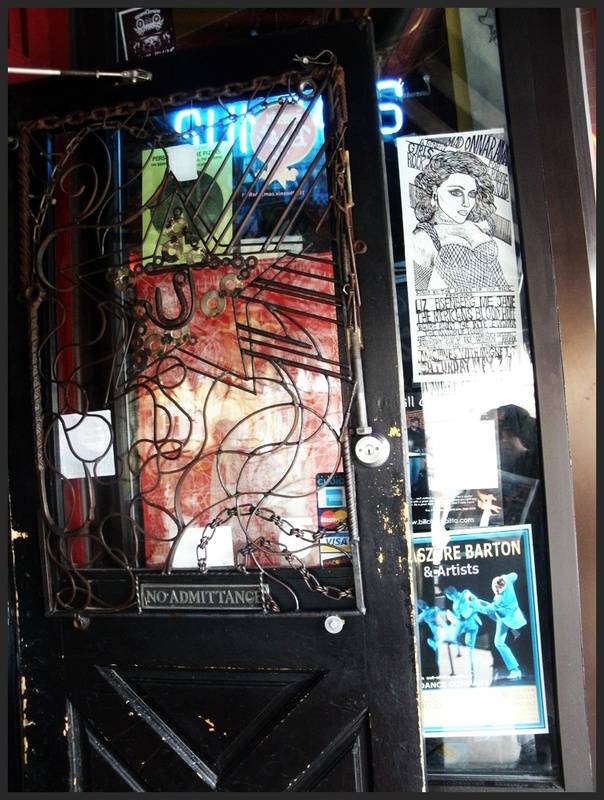 The exterior received a custom design and was painted by hand to maintain a bit of the creative, homemade aesthetic of which Julian’s has come to be known for. The Omnibus can be found at special events such as Water Fire, art festivals etc., and is available for private functions such as weddings, birthday parties etc., You can find more info on the Omnibus HERE. Check out a Youtube video of the Omnibus HERE. You can next find the Omnibus on April 30 (10am-4pm) at Rhode Island Antique Mall (345 Fountain Street, Pawtucket, RI). 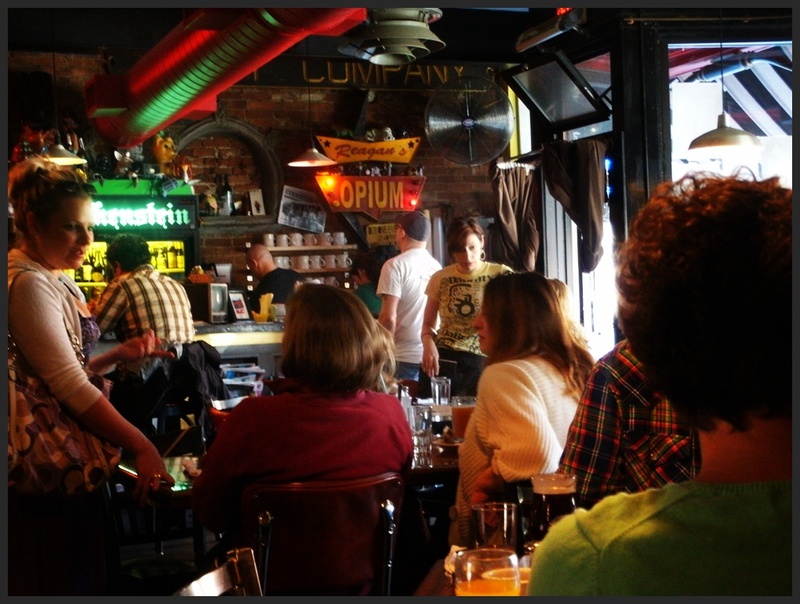 Julian’s has a series of beer dinners which occur every 6-8 weeks, consisting of a 6 course meal paired with 8 beers. Their next event, Heavy Seas Beer Dinner, is May 15, 2011. Reserve by calling 401-861-1770. 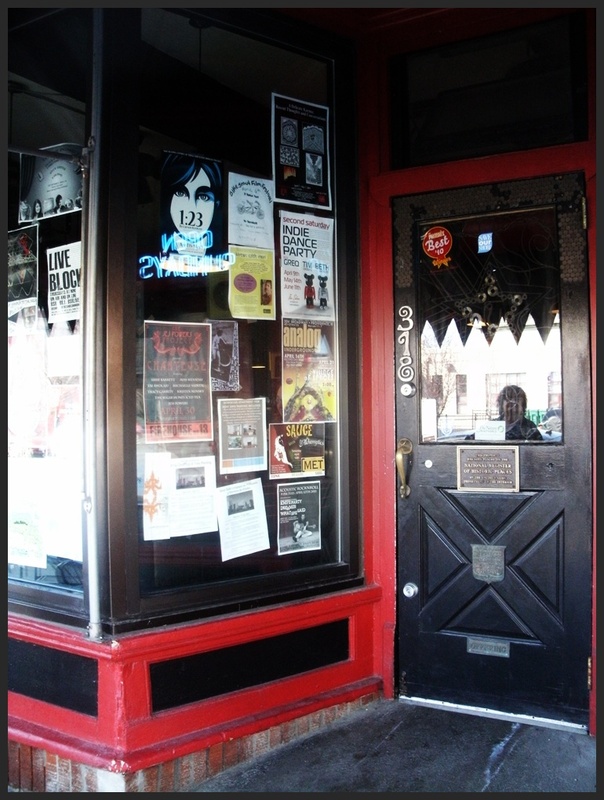 You can purchase Julian’s merchandise, including their granola, mild sauce & catsup, HERE. Julian’s features local art work throughout the restaurant. Running now until May 1st is Hannah Antalek collection. Learn more HERE. Follow Julian’s on Facebook and Twitter. Gay & Lesbian Factor: Really? How can I even attempt to write that about Julian’s. OF COURSE Julian’s is LGBT friendly. 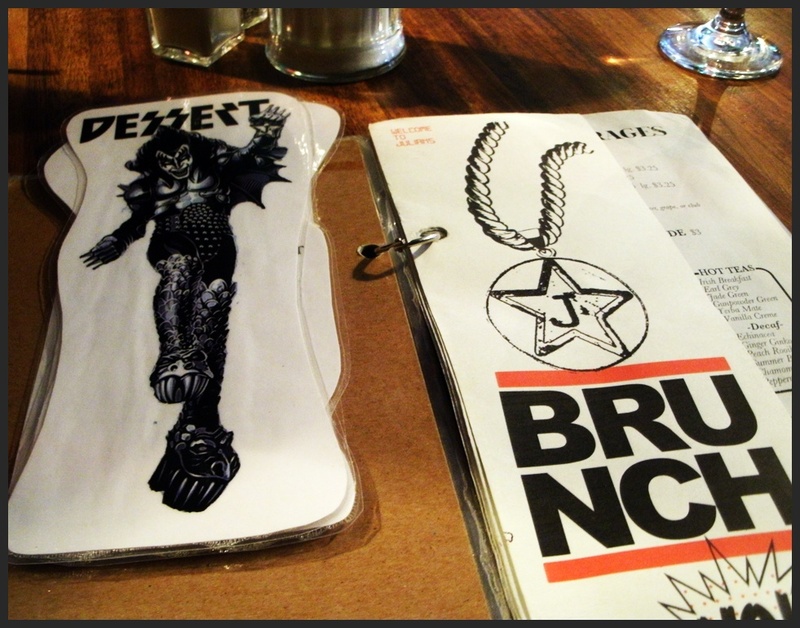 I observed way more than the usual “1 in 10” while there for brunch on Sunday. Everyone and everything is welcome at Julian’s! Don’t even finish reading this review — just GO — NOW. Heck, I may even stop writing and head back there. A 10 out of 10! I am hearby “OUTING” Julian’s as gay & lesbian friendly (oh, screw that — friendly??? It is FAGulous!!!) and worthy of our business but we may not be worthy of theirs!! It’s true. Julian’s is the type place I could have all three meals at, a drink or two (or ten), socialize with friends, hide away in a corner and read a book, sit outside and people watch, watch some TV in the bathroom, get into a text messaging fight with my partner, dine with my mother and not have anyone even blink twice as she introduces herself as “the mom”, and take a million pictures of and still want to take more. 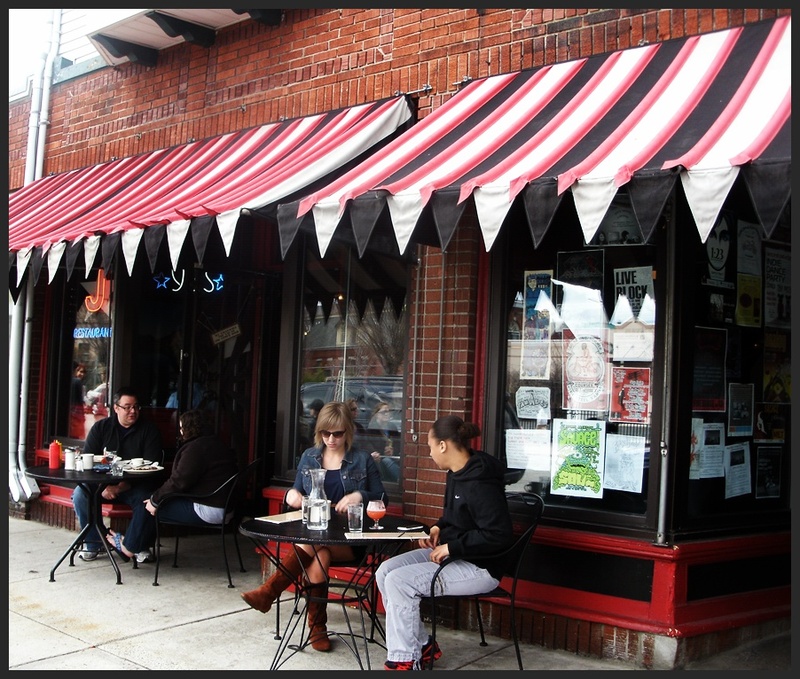 ← Meeting Street Cafe – Providence, RI – Located Up Gay & Lesbian Friendly College Hill.